The iconic Squirrel stove has been redesigned for Winter 2018. The result is this stylish triangular wood burning stove, that will fit perfectly into a corner. When installed with an insulated flue, it can be placed just 125mm from the wall to either side in a corner, making it an excellent option for smaller rooms that do not currently have a chimney. 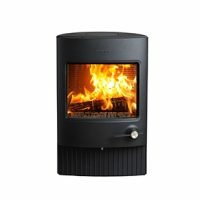 With airwash technology, an efficiency of 81% and SIA Ecodesign Ready, it is a great example of a modern stove.